Hybrid Camera Revolution: Free Metabones adapter or Rokinon lens with new 4K JVC GY-LS300 at 3/18 LA event! Free Metabones adapter or Rokinon lens with new 4K JVC GY-LS300 at 3/18 LA event! In another sign that JVC is going "all out" with the introduction of the GY-LS300, selected dealers are offering a Metabones adapter (EF, Nikon G or PL) or one of two Rokinon full frame Cine DS lenses (24mm or 35mm) for free with the purchase of JVC's new 4K Super 35mm camcorder. This would be a savings of up to $799 (for the Rokinon 24mm Cine DS lens). If you want to see the camera in person before you order, EVS is hosting the LS300's "LA debut" on March 18th from 1:00 to 3:00PM at their Glendale store. JVC execs and techs will be there - and there will be a free (with security deposit) "rent before you buy" promotion. 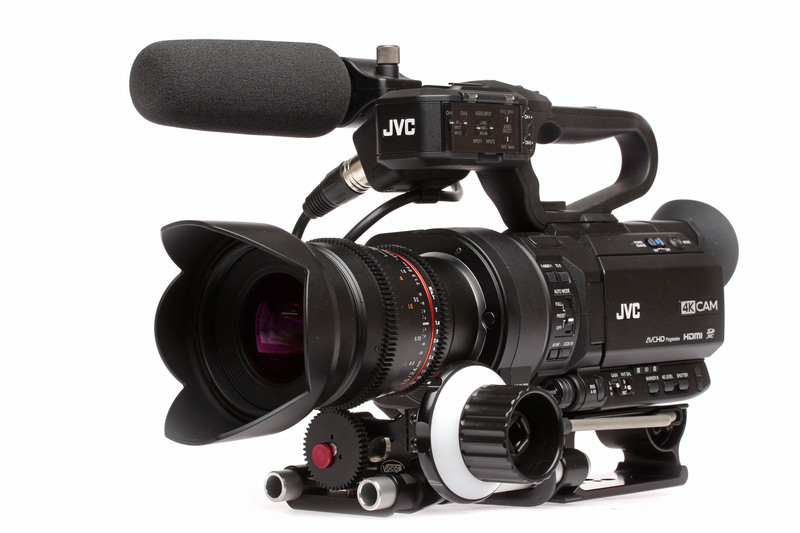 And if you don't need interchangeable lenses, you can get the new 4K JVC GY-HM200 with its fixed 12x zoom lens, and 2/3" sensor for just $2695. The HM200 is going to put a lot of pressure on the much more expensive 4K camcorders from Sony and Panasonic, the FDR-AX1 and HC-X1000 (as well as JVC's own GY-HMQ10) . My guess is that the prices of these cameras will have to come down.